Meet our team and join our sessions at the following conferences and meetups. Also, volunteer your distributed systems knowledge - speak at lead discussion at one of our future meet-ups! The Terracotta / Software AG team will be out in full force. Join us at our booth, see demos, get technical assistance, and win prizes. 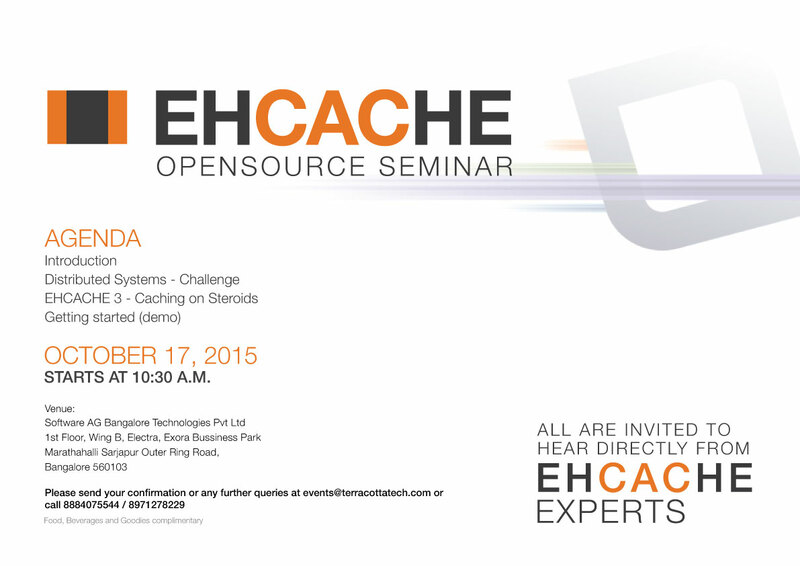 Also, don’t forget to catch talks given by the Ehcache / Terracotta / Software AG crew! CFP Open - Looking for another speaker! Henri Tremblay presents his talk “Learn Java 8: Lambdas and Functional Programming”. And chat with Ehcache and Terracotta developers around the JavaOne floor throughout the week! Plus snacks and great conversation with other folks interested in distributed computing. Terracotta open sourced it’s core offheap library earlier this year. […] What follows will be an explanation of how well understood CS concepts from managed and unmanaged programing environments combine to produce a stable, reliable, and useful library. As the EG is looking at addressing the current shortcomings of JSR 107 with a future JCache 2.0 API, what can you do now to address your advanced caching use cases? Go for proprietary APIs? The brand new Ehcache3, besides ease of use, was crafted with that exact goal in mind: looking beyond the current spec. With close to no API tie-ins, Ehcache3 enables you to extend the JSR 107 API transparently. Whether you want to go off-heap and scale up; scale out by clustering your caches; or require transactions, automatic resource control, or scaling out of writes with write-behind, everything is available to you through a couple of configuration tweaks. Not only minimally intrusive but also available for free today in the open source Ehcache v3. The Java caching standard (JSR 107) was finally released in 2014, after 13 years of on-and-off work. The caching community has already started to move on, however. There is already discussion of what is missing from the current standard and what could or should be included in JCache 2.0. The JSR 107 specification leads and expert group members would like to engage the community in an open discussion of JCache 2.0. What important features are missing from JSR 107? What use cases should a future JCache 2.0 support? What features would be required to support those use cases? Attend this BOF session, get your voice heard, and engage directly with the rest of the caching community to help define the genesis of a JCache 2.0 standard. Great opportunity to hear directly from the architects and developers of Ehcache. Learn about exciting new offerings, JSR107 and the roadmap ahead. You can also use this occasion to meet and directly talk about your use cases with them and also get to know how you can become part of the large open source ecosystem around Ehcache. View flier with address and other details. The recording is available for replay thanks to the Spring website.